Drain the juice from the pineapple and oranges into a bowl. Save juice. 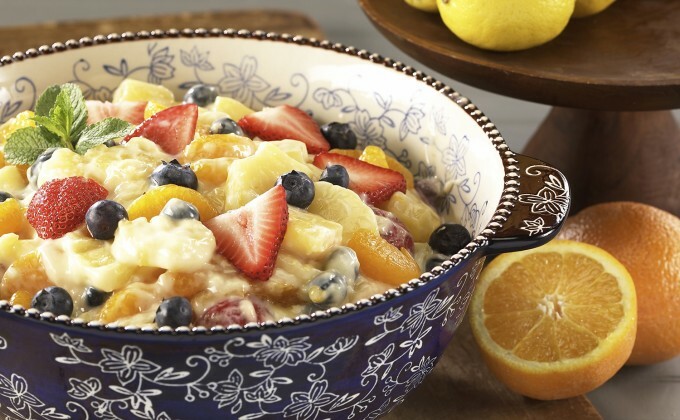 Place pineapple, oranges, strawberries, bananas, blueberries and raspberries into your temp-tations® 4 quart bowl. Set aside. Prepare pudding mix according to package directions but use 1 cup of reserved juice for the liquid. Stir in vanilla extract. Gently fold pudding mixture into fruit. Cover and refrigerate for at least 2 hours.